My Civil War Obsession: Diminished killing? This brief line from the Covington Journal May 3, 1862 is a bit ironic given the Civil War's reputation as the deadliest conflict in American history and all the contemporary talk about the slaughter of so many lives. Of course, this also may show how using one example to reach a large conclusion may not be the best course. It is remarkable that in proportion as the enginery of war is improved the destruction of life is diminished. To have taken Fort Pulaski by the old method would have involved the slaughter of hundreds; to take it by means of the "latest improvements" in artillery, cost the life of but one man! 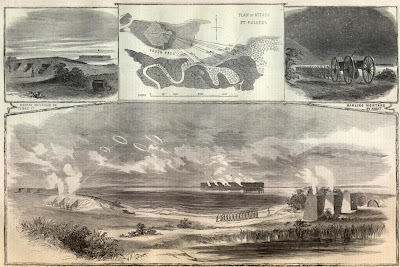 Here is a story about the Union capture of the fort in April 1862, with only one casualty on the attacking side, but a few more for the defending Confederates.